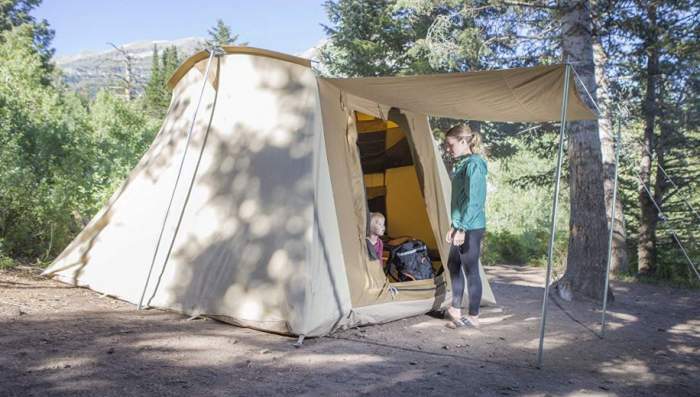 Teton Sports Mesa 14 Canvas Tent is a very tall cabin style tent built from breathable cotton fabric and with a steel frame, suitable for all seasons. Teton Sports Canvas Tent; Cabin Tent for Camping in All Seasons. This is a canvas tent. The number 14 describes one of the dimensions of the tent which is 10 x 14 feet, to distinguish it from the Mesa 10 which is 10 x 10 feet. And this is a canvas tent with all advantages (and downsides) that go with it. In my earlier text about tents’ materials, I summarized some features of such materials so no need to repeat it all here. Just to say that such materials are breathable and the general atmosphere in the tent is cooler. But as you can imagine, these are also heavier materials and it is necessary to keep them completely dry when you store the tent at home. This is a very heavy tent and definitely not freestanding, so choose the camping location properly so that you can stake it down. Once it is done, this tent can take a lot of pressure from any side. By the shape, this is a cabin style tent, very tall and with 78 inches (198 cm) of the peak height. This is high enough for most users to stand upright in the tent. The thick cotton fabric used here is such that it blocks daylight and you have a dark rest design. Huge awning created by the door flap and two included poles. Capacity-wise, they say it is for 6 to 8 people. Now the dimensions are 14 x 10 ft (427 x 305 cm) so squeezing 8 pads on the floor is very difficult although indeed possible. The total area is 140 ft² (13 m²) and if used by 6 people you would have 23.3 ft² (2.17 m²) per person which is very reasonable; for 8 it is not so. But for real camping, this is for parents with the maximum of two small kids. Seasons-wise, this tent is designed to be used in all seasons. In the summertime, it makes a cool atmosphere due to its canvas and you will feel pleasant because it is breathable. They claim it is fully watertight, and the poles are incredibly strong. Climate-wise, very similar to what I already said above, such canvas tents work better than any other type in all climates. The thick canvas insulates better than any synthetic material, and the construction is such that you can fully close it when it is cold. Weight-wise, well you cannot use the usual criteria here. Canvas is heavy so this tent weighs 80 lb (36.3 kg). This is a lot, but in the comparison table below you will see that this is quite a typical weight for such a tent. The packed size is also far from what you might be used to see in usual synthetic tents, see in the specifications below. This, and the mentioned weight imply that you need a car for transportation and lots of space in the trunk. The tents body is 100% cotton canvas 285 g/m², and they claim it is watertight up to 350 mm. This does not look so impressive, it is below the value of an ordinary umbrella. The floor is Super-Duty 19 oz interwoven polymer, this is a very durable and completely waterproof material. Waterproofness of a canvas is based on a tight weave. When exposed to moisture, the fibers swell and tighten so this is a self-sealing effect. But it remains breathable even in such a case. Also, here you cannot use the usual tape-sealing for seams which you have in synthetic tents. This is more complicated and this is why such tents are expensive; what you have here is not an ordinary cotton canvas which absorbs moisture like a sponge. The poles are steel and the ridge pole is a patent pending T-1 quick up steel pole system which is completely different from its competitors, see the picture. Though, I do not think it is even close to its competitors regarding the durability. The ridge pole is completely different from the competitors. There are two vertical shock-corded 3-segment side poles which support the main ridge pole, plus 4 thinner roof poles that tension the roof and converge to the place where they connect to the ridge pole. 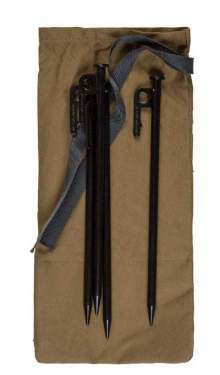 Also included in the package is a pair of shock-corded 3-segment thick poles for the awning which you can create on one side. There are plenty of very strong and long stakes, see a few of them below. A few of the stakes, there are many more. This is the tent packed without poles. There are 2 oversized doors, both double layer type, with a screen for ventilation and protection from insects, plus canvas for privacy and rain protection. The doors are very tall as well and it is easy to get the tent furniture in. The door flap can be used to create a huge awning with the poles included; you have eyelets on the flaps for this purpose. Inside you have six storage organizers and they include 2 large pockets, 2 multi-pockets, and 2 overhead storage equipped with load stabilizing drawstring. There are multiple rings for gear attachment. You also have 2 zippered power ports. They use high-quality and large #10 SBS zippers. Note that there are no separate windows. The tent is also equipped with a pair of vents under the roof so you have an extra ventilation with the breathable materials. As of the moment of writing this text, the Amazon price for this tent is around $550. This looks a lot but you will be able to see below that it considerably less expensive than its competitors. It has been on the market for a short time so the number of reports is limited, but on Amazon so far it has received a perfect score 5.0/5. My rating is quite different but I use several criteria, and I use them consistently for all tents here in the site, so it is best to make a comparison and not to take the absolute values for the rating. Type: cabin style non-freestanding 4 season tent. Weight: 80 lb (36.3 kg). Capacity: 6 – 8 people. Dimensions: 14 x 10 ft (4.27 x 305 cm). Area: 140 ft² (13 m²). Area per person (for 6-person use): 23.3 ft² (2.17 m²). Peak height: 6 ft 6 in (78 in; 198 cm). – Tent: 38 x 17 x 8 in (97 x 43 x 20 cm). – Poles: 38 x 7 x 5 in (97 x 18 x 13 cm). If you feel that this Mesa 14 is similar to some already existing tents on the market, you are right. Here I give two of them, and as you see they are almost identical by parameters. But there are differences in the design in general (see the doors for example) and in the main ridge pole; the Mesa 14 pole is completely different from the other two that have the same design. Note that the prices (as of the moment of writing this text) are, respectively $550, 616, 748. The differences may look substantial, but these are tents built to last for years so I would not pay much attention to this; better chose the brand which you trust. Weight: 69 lb (31.3 kg). Size: 10 x 10 ft (305 x 305 cm). 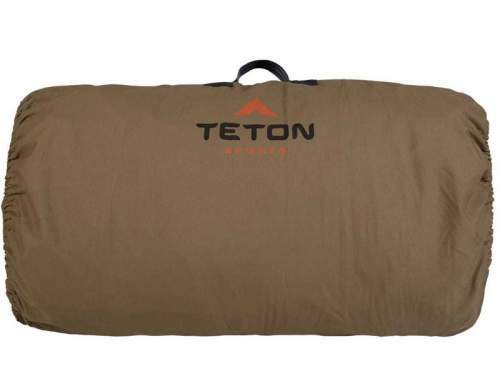 So you realize that this Teton Sports Mesa 14 Canvas Tent is very similar to some other canvas tents on the market, but it comes with some unique features in the roof pole design, and it is more affordable than its competitors. I do think it is worth the money. I have included this tent in my list of best canvas tents for camping. As typical for such canvas tents, it is heavy but one person can set this tent up, and the feeling in such a tent is beyond comparison with any synthetic material tent. Though canvas needs lots of care, so dry it properly before storing at home. Note that they also have the other type of canvas tents, so see this Teton Sports Sierra 16 Canvas Tent. But you might want to compare it with this Springbar Highline 8 Tent which is a canvas tent with a very similar design and also this Kodiak Canvas 12×9 Canvas Cabin Tent. Yet another tent in the same style is this White Duck Outdoors Family Explorer Basic. If you need something totally different but built from canvas, please check this Crua Loj 6 tent, this is an insulated tent for all seasons, unlike anything else on the market. They also have a smaller Crua Tri 3-person tent. On the other hand, if you need a tent with a stovepipe port, check this Arctic Oven tent, and also the Playdo 4-Season tent and this Russian Bear Winter Tent With Stove included. Please let us know if you have experience with these tents, there is a comment box below. I wish you a pleasant day.